Weaving, the production of cloth by interlacing threads or yarns, has been a foundation craft of civilization since prehistoric times. Together with spinning, the production of thread or yarns by twisting plant or animal fiber, weaving allowed clothing to be made from renewable resources. With the introduction of farming and animal husbandry in the Neolithic period, a ready supply of fiber was available to produce cloth without killing an animal for its fur. This allowed scarce resources to go further, clothing many and creating wealth. Opinions about the genesis of tartan cloth vary widely. From the chequered cloth wrapping the Ürümchi mummies dating from about 2000 BC, to the Falkirk Fragment dating to 300 AD, there is much speculation about what could be considered tartan. When did it come about? Is it indigenous to the highlands of Scotland? Where does the name “tartan” come from? – there are more questions than answers. Do a web search on “tartan history” and you will find many stories, and few documented citations. The 1747 Act of Proscription following the disaster at Culloden, and the romantic re-invention of tartan in Victorian times has added to the confusion for the serious researcher. One thing seems safe to say: by the 1740s, the Highland Scots could be found wearing kilts made of tartan, and had been doing so for some time. You will find the RenScots weaving tartan at Celtic events for the public to experience and enjoy. We use modern looms to show an ancient craft in deference to weight and cost. We frequently have The Colorado (STA: 4554, STWR: 2787) or the American Bi-Centennial St. Andrews (STA: 91, STWR: 91) on the loom. Both are examples of District tartans – tartans of a place, rather than a particular family or clan. We also encourage weavers, and can assist those who wish to learn tartan weaving. 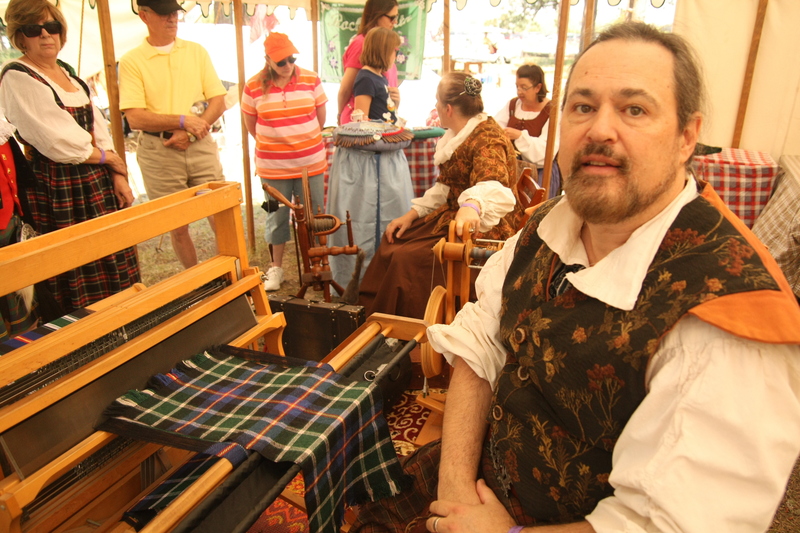 Come visit our weavers at festival, or contact us at weavers@renscots.org. 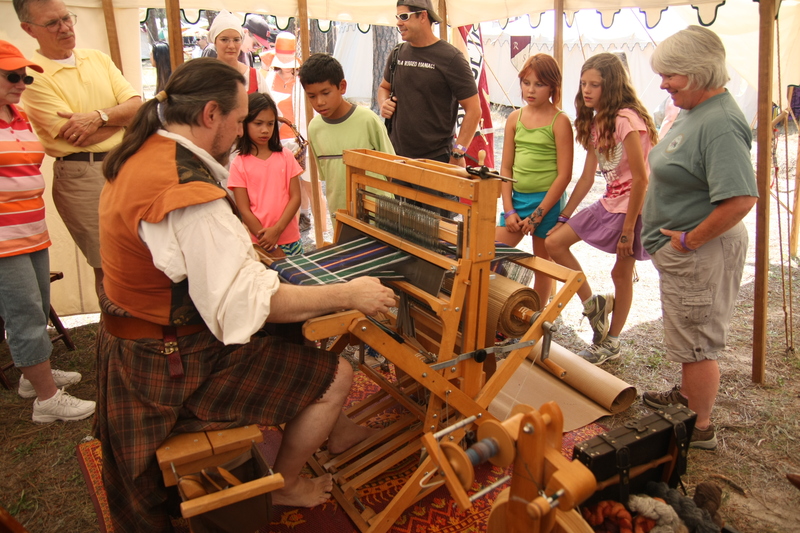 Find Tartan Weaving in the RenScots Living History Village in the Wick and Woolery Pavilion. In 2008, members of the Scottish Parliament voted to establish a single, independent Scottish register of tartans which promotes and preserves information about historic and contemporary tartans from Scotland and throughout the world. The Scottish Tartans Authority was formed in 1996 as a Scottish registered company with charitable status, dedicated to preserving, promoting and advancing Scottish Tartans – their origins, history, manufacture, use and development. Peter MacDonald is Scotland’s foremost tartan historian specialising in all aspects of Tartan and with a particular interest in Jacobite era patterns and techniques through to the early commercial production of tartan by the famous weaving firm Wilsons of Bannockburn. With an emphasis on historically accurate research this site is your starting place to discover Scotland’ unique textile heritage: from the traditional to unusual and rare tartans faithfully researched and recreated, to film and book consultancy or new tartans designed with traditional techniques to meet individual customer needs.